On Friday 18th October I attended a meeting between English Heritage and the Druids at Amesbury to discuss the rebuilding of Woodhenge. Every one there seemed very keen to find a way forward. The Druids went there believing Sir Jocelyn Stevens chairman of English Heritage would be there. He was not. Mrs Clew Everard who runs Stonehenge for EH was his stand in, backed up by two security guards and an archaeologist. The disappointment was that the rebuild was not going to be a rebuild at Woodhenge, but a simulation in a square shaped wood about half a mile west of Woodhenge. The bureaucrats appeared to have no understanding at all that one must have a sacred site before one could have a sacred building. EH were accused by several speakers of not respecting the sanctity and the spirituality of the stones. The EH archaeologist said Whitby Abbey has a spiritual input and EH had ignored spirituality in the past, but was now very aware of the spiritual input on sites. Woodhenge is under the sign of Mercury who is credited with inventing the lute. He is the God of stringed instruments. John Michell’s book The View Over Atlantis has a chapter on Woodhenge which is well worth reading. I must congratulate you and your helpers for a first class Newsletter. So far I have been unable to attend any meetings but the Newsletter is such that I feel an informed member of the group. Michael Guest’s article, although now a little old, quotes information which is just as valid today as when it was written. He stresses the point that ‘tuning the mind’ is the most important part of any dowsing operation, a point with which I wholeheartedly agree. Hammering stakes or painting aluminium blue are wonderful ways of impressing a patient or client, but they must only be ways of concentrating the mental processes, otherwise there wouldn’t be so many ways of getting the same result. It is also true to say that many dowsers can get the same result without using any visible assistance – but the patient or client won’t be nearly as convinced of the cure! On now to the subject of underground streams. The flow of water under pressure through narrow orifices i.e. flowing through minute cracks in bedrock, not only dissolves various salts, as Michael Guest notes, but can also act rather like air flowing through the slit in an organ pipe. The difference is that the water doesn’t (usually) produce audible signals but does produce magnetic and electrical disturbances under these conditions. These disturbances are ‘piped’ to the surface in a fairly discrete beam and can easily be detected by dowsers. But note that there are two components, magnetic and electrical. It appears to me that some dowsers detect only electrical components, which can be easily screened, and some detect the magnetic components which are very difficult to screen. Add to this, the fact that both components have frequencies, i.e. it is not static electricity and not a steady magnetic field, and you have quite a complex system where, if consistent dowsing results are required then fine tuning of the mind is essential. The water containing rock fissures produce signals which are very similar to those produced by dry rock movements – particularly noticeable before earthquakes when animals and some sensitive humans get very upset. The frequencies of the electromagnetic disturbances are quite mixed in the case of rock movements, but seem to be more specific in the case of the water containing cracks. The electrical frequencies are of little importance compared with the magnetic frequencies and a great deal of scientific investigation of these frequencies (artificially produced) has taken place in the last decade or so. In particular the magnetic frequencies are well within the range produced by the human brain, so that receiving these frequencies, typically 8-20 Hz. can disrupt or modify brain processes. Our ancestors could identify these emissions through their innate mental sensitivity, something which most of us have lost. However they chose many of these areas of emissions as sacred spaces where Mother Earth spoke or sang to them and where they could receive visions or inspiration. 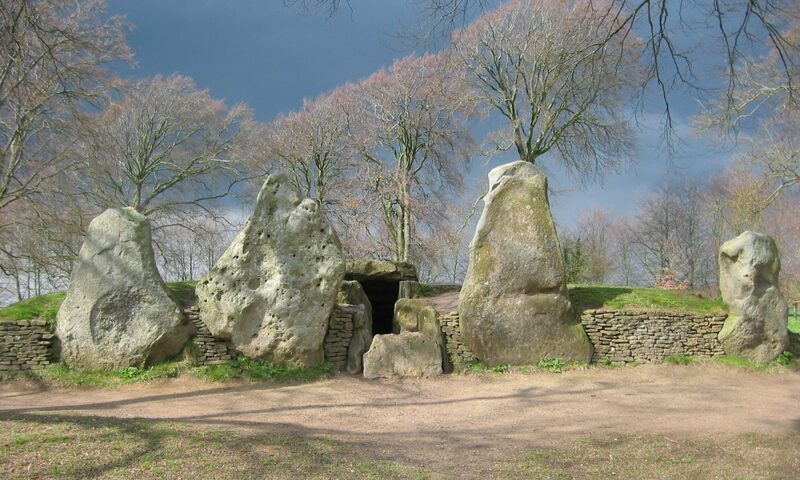 And, of course, erect stone circles, burial mounds, megalithic tombs, temples and churches. Today there is a cult of the sacred space where visions can be seen, strange dowsing results obtained and many books written! Could we be using the same emissions? I mentioned above that scientific investigation of these extra low frequencies (ELFs) has taken place. One recent report on TV stated that brain wave frequencies fed back into the brain could increase imagination and artistic sense when used at very low strength. Even going back 30 years, one scientist reported that the results were similar to those obtained from popular drugs. Going now to a different subject from the Newsletter, that of Dr Harvalik’s experiments described by Capt. J A Fergusson-Cunninghame. There must be something wrong with me – I can’t get the experiment to work. I followed his method, using 4 layers of aluminium foil instead of 3 around my head and waist and found that I could still detect water lines, ‘energy lines’ and anything else I wanted to dowse. I tried shifting the bands up or down to make sure they covered the areas shown in Christopher Bird’s book but that didn’t make any difference. Finally I put 4 layers of foil in my shoes, while retaining the bands around head and kidneys. The result did make my wife fall about with laughter but I was still able to dowse. Has anyone else tried it? Lastly a comment on Jan Spence’s church dowsing. Any emotion leaves an ‘impression’ in the immediate vicinity, the stronger the emotion, the stronger the dowsable ‘impression’. My wife has named these ‘impressions’ as ‘trauma centres’ because violent tempers, severe injuries, deaths and suchlike leave black areas in many places. They are especially noticeable in houses where, as examples, an old lady had fallen downstairs and broken her hip; someone, many years ago, had died in the place where the house owner worked; and a place where a violent argument and a fight had taken place. In each case the present owners of each house had felt uncomfortable in the appropriate areas. They were all easily and effectively de-energised. I am suggesting that a similar situation may occur in a church. The congregation releases emotional energy, especially at church or religious festivals, which is retained and then gradually dissipated because it was not strongly established. The stronger the emotion, the longer the ‘trauma centre’ will last. I have used such an area to track down a Roman barracks and to identify the site of the sack of a Saxon fortress accompanied by the massacre of its defenders. In both cases the ‘trauma centres’ were easily identified because they were so strong. That’s probably more than enough contentious information & opinions for the present. Keep up the good work in the Newsletter.